Tideflex Thimble Plates allow slip-on Tideflex Valves to be mounted to concrete manhole and headwalls. They minimize the number of anchors required compared to an ANSI flange, thereby minimizing installation costs. The thimble plates also allow the Tideflex to be easily removed when access to the upstream pipe is required. Thimble Plates are custom designed for each application and are available with circular, square and rectangular flanges. The flanges can also be fabricated with a radius to match the radius of circular manholes. Specials designs with angular offsets are available when the outfall pipe is not perpendicular to the headwall. Cast-in thimble plates are available for new concrete construction. The thimble gets cast into the concrete wall and the pipe stub protrudes thru the wall to allow the installation of the Tideflex Valve. Flanged Thimble plates are supplied with gaskets factory-bonded to the back side of the flange to simplify installation. 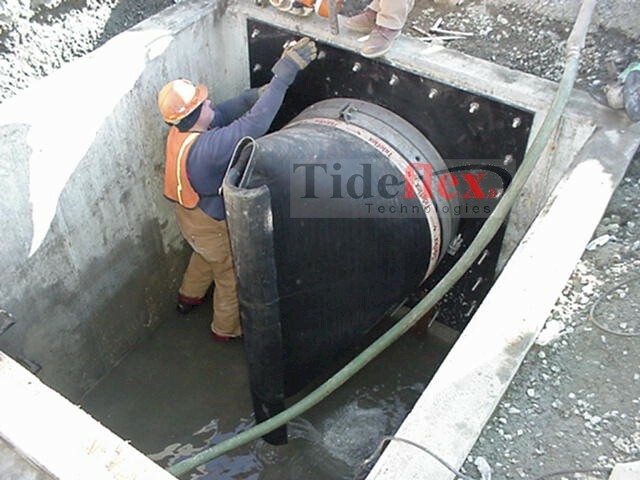 Tandem Tideflex Thimble Plates are custom designed for large rectangular and irregular outfalls. The Tandem Thimbles allow multiple Tideflex Valves to be mounted on a single plate. Thimble Plates can also include Saddle Support Technology (SST) when increased backpressure ratings are required.